Few places can match Italy for natural beauty: while Italy’s countryside exudes charm, Italian cities show off their distinctive culture, reflected in architecture or even in their people. Many successful films have been set in various areas of Italy, making the country not only important to the setting, but also the plot of the movies themselves. To see many aspects of the Italian landscape and culture, consider watching these very fine films. Based on the story by Luciano Vincenzoni, Malena is an unforgettable film. Directed by Giuseppe Tornatore, this critically acclaimed and award-winning Italian film is set in a small coastal Sicilian town. Malena is the town’s beauty and her life choices are at the center of the film, her story narrated by a young boy, who repeatedly fantasizes about the woman. This haunting film is both poignant and comical. It delights with its depiction of human nature’s good and bad traits. The town where it is set is actually fictional, but it was filmed between Siracusa, Catania, Realmonte, Poggioreale and El Jadida. Destined to be a classic, A Room with a View is an award-winning gem centered in and around the countryside of Florence. This romantic backdrop is the Victorians’ answer to the greyness and filth of industrial London. However, our heroine finds that her hotel has not provided her with a view of the city. Yet, as she changes her room, so too does her life, which takes some surprising twists. This excellent film stars Helena Bonham-Carter, Maggie Smith, Daniel Day Lewis and Julian Sands. It is based on the classic novel of the same name by E.M. Forster. Heaven was directed by Tom Tykwer (the man behind the acclaimed Run Lola Run) and stars Cate Blanchett and Giovanni Ribisi. It is a film that can only be described as both riveting and haunting. Set in Turin, an English teacher named Philippa is at the heart of this plot that glistens with moral choices depicted with modern twists. This is a plot about revenge and redemption, about honor and survival. Life is Beautiful, or La Vita e’ Bella is a cinematic delight that will leave viewers laughing and weeping equally. Roberto Benigni won best actor for his performance as a comedic waiter, who charms his way into the heart of a beautiful woman. Together, they create a beautiful life that is further blessed by the delightful exuberance of their son. This colorful love story might remain exactly that, if WWII and its concentration camps did not darken the screen. A film about love and hope, it is also a testament to keeping courage and humor in the face of great hardship and tragedy. 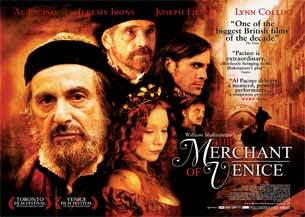 The Merchant of Venice matches one of Shakespeare’s most notorious characters with one of today’s most beloved actors, Al Pacino. His portrayal of the lending Jew Shylock is a first rate performance, but the other actors are also equal to the task: Jeremy Irons plays Antonio and Joseph Fiennes plays his young friend, Bassanio. This classic play set in Venice portrays the conflict between moral law and the law of the land with renewed zest. Also set in Venice, Dangerous Beauty is a passionate foray into the life of historic courtesan Veronica Franco, played by the beautiful Catherine McCormick, of Braveheart fame. The film depicts her life before the fearful actions of the Inquisition, as well as after. Rufus Sewell plays Veronica’s life long love and their chemistry on screen is real enough to make you blush. With excellent cinematography, this film captures sixteenth century Venice, when it was indeed the gateway to the east, and master of the Mediterranean. Recent years have brought once again great glory to both Italian cinema and Italy as a setting of cinematic works. In 2013, out came La Grande Bellezza, by Italian director Paolo Sorrentino, winner of the 2014 Oscar as Best Foreign Movie in Los Angeles. The movie focuses on the figure of an aging writer who, on occasion of his 65th birthday, decides to take a stroll in the streets of his city, Rome, while reflecting on his own existence. The movie, which proposes a thoughtful insight into the lives of several characters, also displays the city in all its beauty, even when neglect and poverty take centre stage. Under the Tuscan Sun is probably the movie that more than any other charmed Italy’s lovers. The movie is about a recently divorced writer that travels to Tuscany and soon finds a villa to buy and renovate. She befriends her italian neighbors, the polish workers that are helping her in the restoration, and an eccentric british actress. It’s the start of a fresh new life. Of course moving to Italy is not as easy as depicted in the movie, but it probably convinced many to leave or at least let them think about it. The movie is set in the town of Cortona, in Tuscany. Finally, a classic film starring some classic actors: Roman Holiday, starring Gregory Peck and Audrey Hepburn. Hepburn plays a runaway princess who wants to explore Rome like a regular person on her own. Peck plays a journalist looking for a story and becomes something of a tour guide, accompanying the princess on her playful trek. It’s quite true they don’t make movies like this anymore so for a foray into the cinematic past. This film is a real treat, and shows the splendors of Rome off to great effect.